Once again, another year passes, and I take stock of my life: what has worked, what hasn’t, and where I want to go. It’s hard to figure out the latter, however, when you don’t think about where you came from. A film I absolutely love that shows this journey is 1981’s American Pop, an animated film (of adult-oriented) fare by Ralph Bakshi. Bakshi got his start in the ’50s directing episodes of animated shows for television. He broke into film in 1972 with Fritz the Cat. He directed his subsequent films at adults, trying to bring a more mature style of cartoons to the masses. By and large, he succeeded with films like Wizards, The Lord of the Rings, and Cool World. American Pop, though, stands out. American Pop follows four generations of Jewish Americans as they immigrate to the United States in the late 1800s and become involved in the burlesque circuit, vaudeville, two world wars, and the advent of rock and roll. Music is integral to the story and how it is told. It’s almost like a jukebox musical: it takes popular songs and integrates them into the plot to convey mood, time, and place. Unfortunately, due to licensing issues, American Pop fell into the same trap that Heavy Metal did after its initial release: it’s producers purchased the licenses for the theatrical release, but not for the newly-emerging home video market. 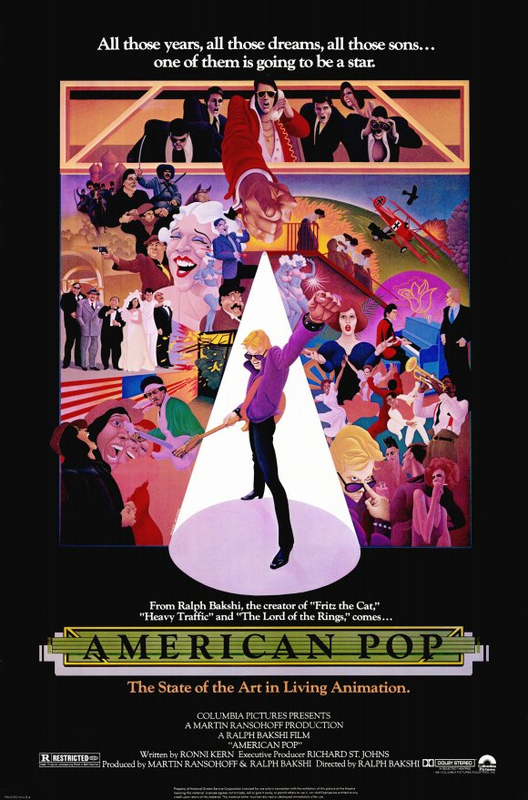 Retroactively getting the licenses for American Pop took 20 years, but it was worth the wait. What a soundtrack. IT includes a few classic songs from the early 20th century like “Lili Marleen,” “Anything Goes,” and “Over There,” plus songs from The Doors, Jefferson Airplane, Bob Dylan, Jimi Hendrix, and Bob Seger (originally, Bakshi wanted “Freebird” to close the film ). I think Seger’s “Night Moves” works, but that’s personal preference. All in, American Pop chronicles not just the lives of immigrants but the life of pop music in the United States. Times Square in burlesque’s heyday. With the help of the music, you get invested in the lives of the characters. They make the best decisions they can, but life sometimes unfolds out of their control: they find themselves being thrust into war, making a risky business decision, or discovering drugs. The film doesn’t sugarcoat the downsides to life, but it remains upbeat, pushing the protagonists forward through the setbacks. The film, like the music, is a metaphor for the American spirit. We shall overcome. Taking a walk through music history. 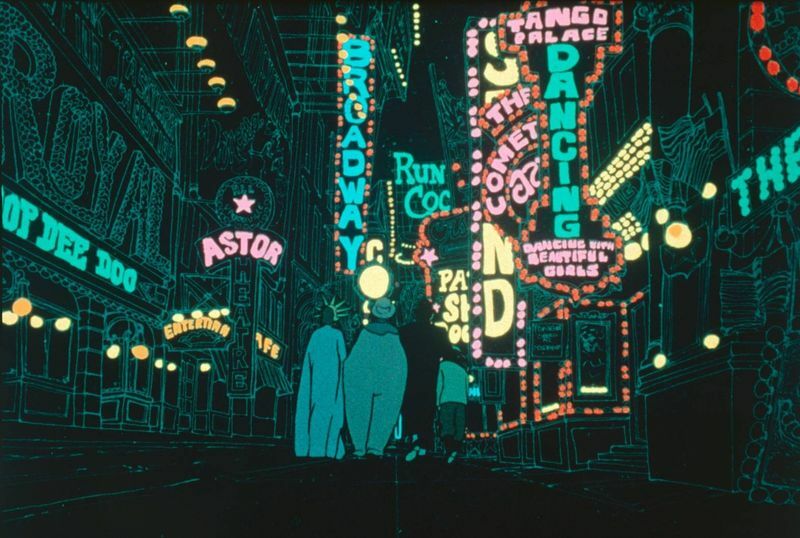 Bakshi was a big pioneer of Rotoscoping (discussed here in my thoughts on A Scanner Darkly) which mainly involves painting/animating over live action. It makes for a unique flow that isn’t seen in traditional animation and walks a fine line between realism and fantasy. 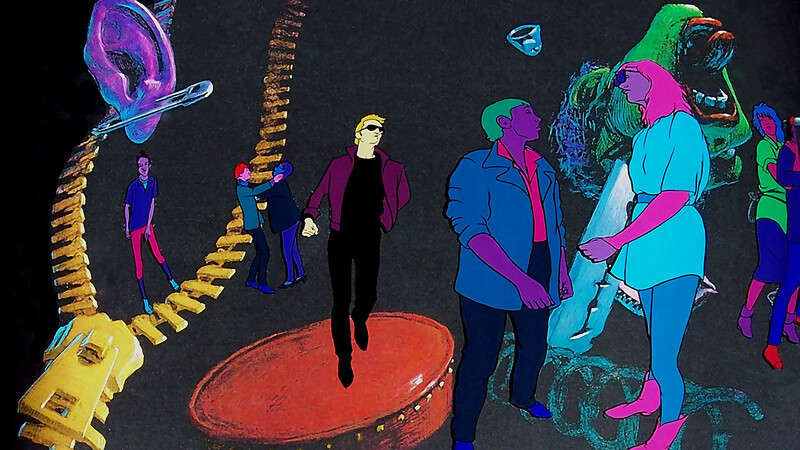 In American Pop, Bakshi uses Rotoscoping, traditional animation, water coloring, some live action, and archival footage. American Pop is different and challenging. There is minimal dialogue: Bakshi relies on the music to convey what’s happening. 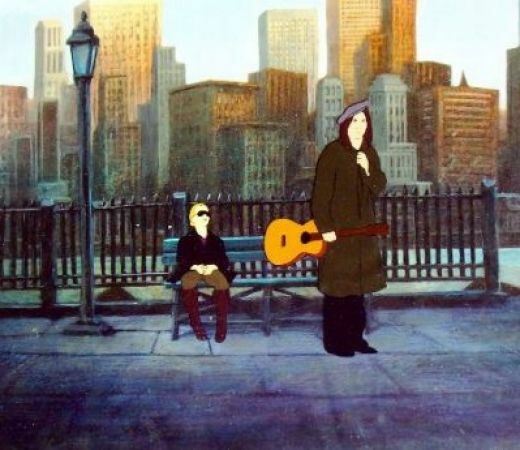 If you’re looking for a unique animated film, you should try American Pop. Who knows? It might get you to think about your own past, present, and future. One generation passes the torch to the next.